Protected membranes are used for swimming pool decks over occupied areas, rooftop pedestrian decks, helicopter landing pads, parking garage floors over enclosed spaces, balconies, and walkways. Sandwich membranes should not be installed without adequate pro- vision for drainage at the membrane elevation; this allows water on the topping slab, as well as water that penetrates the protection layer onto the waterproof membrane, to drain (Fig. 3.56). If this drainage is not allowed, water will collect on a membrane and lead to numerous problems, including freeze–thaw damage, disbonding, cracking of topping slabs, and deterioration of insulation board and the waterproof membrane. Refer to Figs. 3.57 and 3.58 for an example of these drainage requirements. FIGURE 3.57 Dual drain installed for proper drainage of protected membrane level. FIGURE 3.58 Schematic view of drainage requirements for sandwich-slab membranes. For the best protection of the waterproofing membrane, a drainage layer should be installed that directs water to dual drains or terminations of the application. 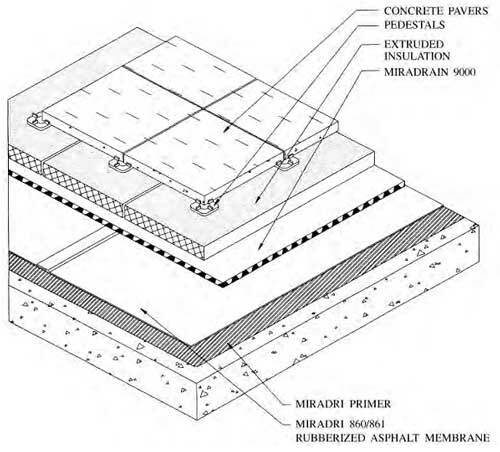 Water that infil- trates through the topping slab can create areas of ponding water directly on top of the membrane even if the structural slab is sloped to drains. This ponding can be created by a variety of causes, including imperfections of the topping slab and protection layer, dirt, and debris. To prevent this from occurring and to ensure that the water is removed away from the envelope as quickly as possible, a premanufactured drainage mat should be installed on top of the waterproofing membrane. The drainage layer can also be used in lieu of the protection layer. However, the sandwich membrane drainage systems have one major difference: they are produced with sufficient strength to prevent crushing of the material when traffic, foot or vehicular, is applied after installation. A typical drainage mat is shown in Fig. 3.59. It is imperative that termination detailing be adequately included to permit the drainage or weeping of water at the edges or perimeter of the sandwich slab installation. This is usually provided by installing an edge-weep system and counter-flashing, as shown in Fig. 3.60. Or if the structural slab is sloped to drain towards the edges of the slab, a drain and gutter system should be provided as shown in Fig. 3.61. Note that in each of these details the drainage is designed to sweep water directly at the pre- fabricated drainage board level. The drainage board should be installed so that the channels created are all aligned and run towards the intended drainage. The entire purpose of the various drainage systems in a sandwich-slab application (drainage mat, deck drains, and edge drainage systems) can be entirely defeated if the pre-fabricated drainage board is not installed correctly.